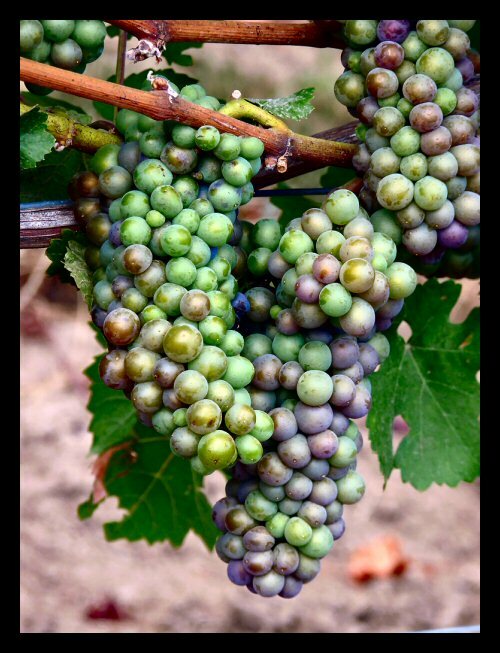 This week's Photo of the Week is a close-up of some Pinot Noir grapes with the first blush of ripening. I live close to a vineyard and have plans next year to take a series of photos every week like this one from late winter to just after harvest. 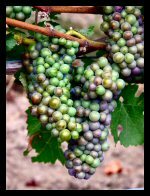 I think it will be interesting to watch the vines leaf out, set fruit and then to see the clusters of grapes enlarge and then ripen. If you come to the Central Coast, chances are wine is part of your vacation or getaway. Whether you are touring wineries and tasting rooms or just having a nice bottle of a local wine for dinner - wine and wine grapes are central now to the local economy. But when you are here, it is like viewing a snapshot - one moment in time - in regards to the grapes. We here in Central California are experiencing a heat wave right now. That is, those who aren't right at the beach. Temperatures are well over 100° and will be there for more than a week. Like everything else, this affects the wine grapes. Up to a point, heat is good for the grapes, but when temperatures are hot like they are now and extended, the vines put things on "pause". Being involved in agriculture is rewarding, but it is quite subject to the vagaries of nature. A late winter cold snap can (and often does) freeze some of the buds the vines have produced reducing the yield. Heat, as we have been discussing, is sometimes a problem. The lack of sufficient heat when a summer is too cool does occur here as well. The farmers and growers have a saying - "Nature bats last". You do the best you can, but sometimes conditions just don't work out. What does all this have to do with your vacation? Well, knowing what goes on in the wine industry might give you some understanding of all that goes into the creation of that wondrous juice in the bottle. If you are a wine club member somewhere you might also have a better understanding of why your favorite varietal is less expensive, but great this year - OR - why it's in short supply and expensive. 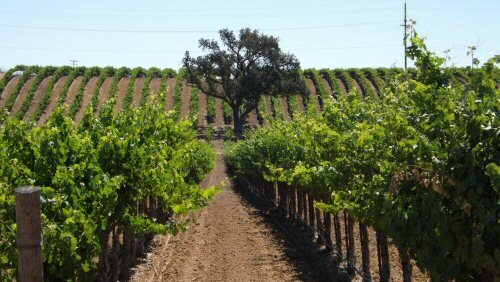 When you do visit Central California, a walk through the vineyards to view the wine grapes on the vine is highly recommended if a winery offers that option. There's nothing quite like being up close to the vines and seeing the growth process right before your eyes. Did you know that you can share that with everyone here by simply clicking on this link? It will take you to a page where you can tell your great "wildlife" story, upload up to four photos and you're done!